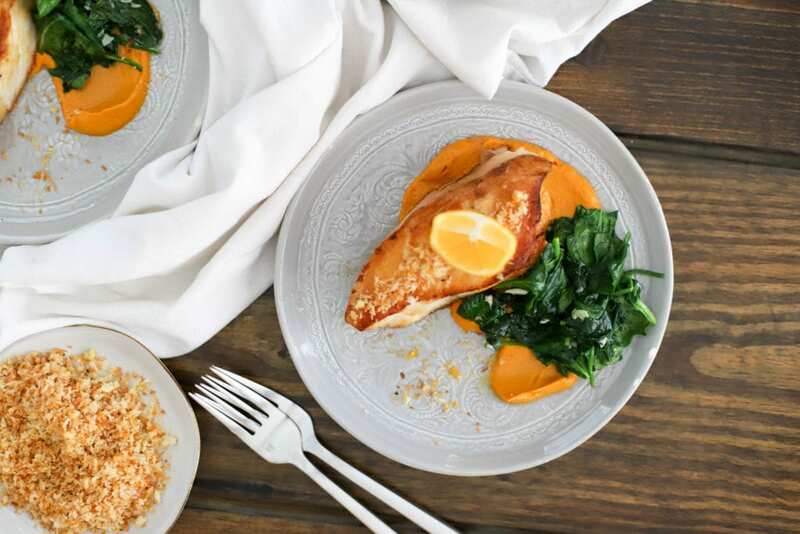 This meal is super easy to make, but takes the teensiest bit of either 1. juggling to make everything go quickly or 2. time to make one piece of the dish at a time. I start by roasting the carrots, then make the breadcrumbs and prep the fish + spinach ingredients while the carrots are roasting. 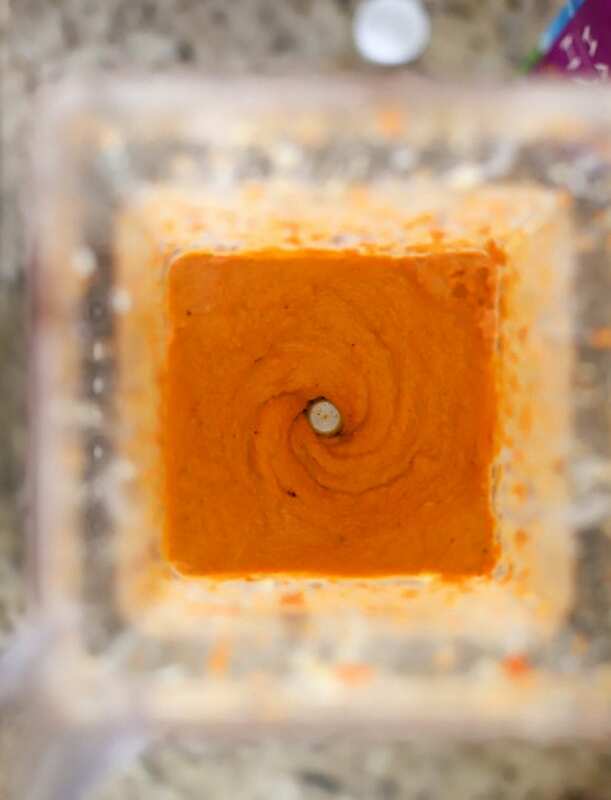 The pureed carrots can also be made in advance and reheated in the microwave – they store really well! 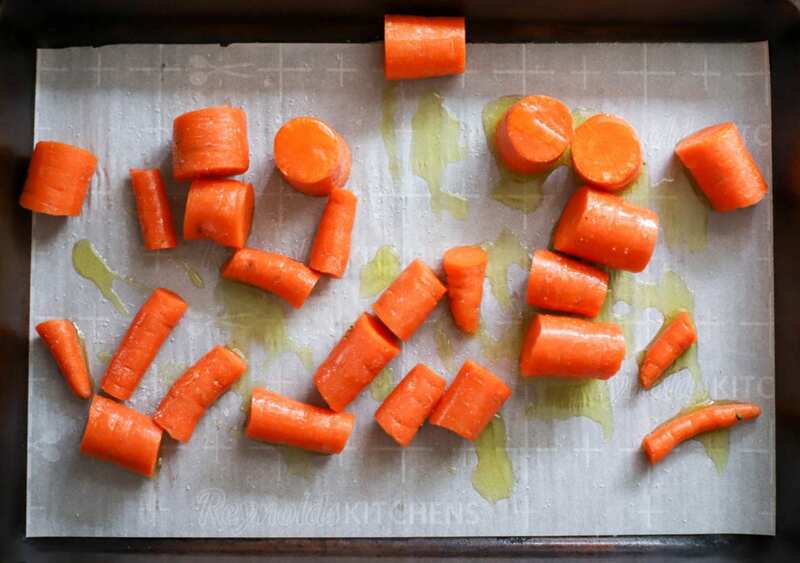 For the carrot puree, preheat the oven the 450F and cut the carrots into chunks. Arrange them on a small baking sheet with olive oil, salt, and pepper. Roast the carrots for 20 minutes or so until they’re dark. 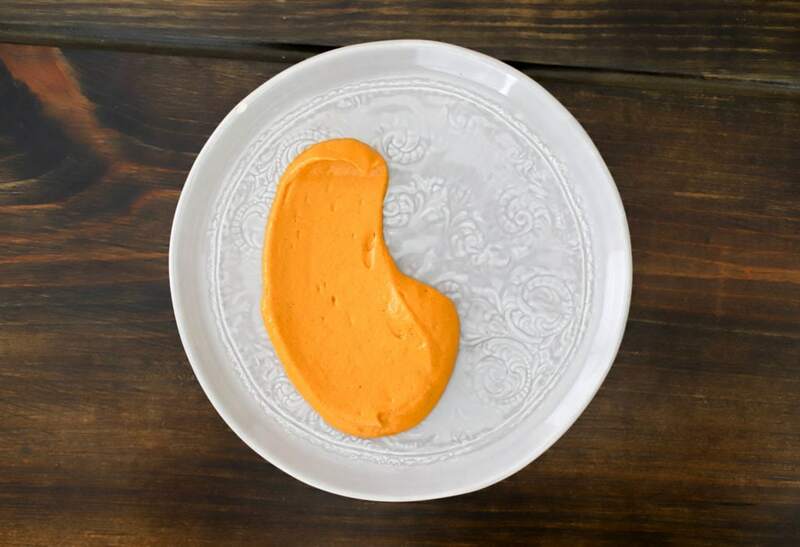 When the carrots are roasted, transfer them to a high-speed blender with half and half, chicken stock, butter, curry powder, ground ginger, and a few pinches of salt. Puree the carrots until they’re super smooth. Adjust the salt level and consistency to your preference; I start with 1/2 teaspoon salt and increase from there. If the carrot mixture is thick, add more stock a tablespoon at a time until the carrots are spreadable but not overly liquidy. Thin mashed potatoes is the consistency we’re going for. 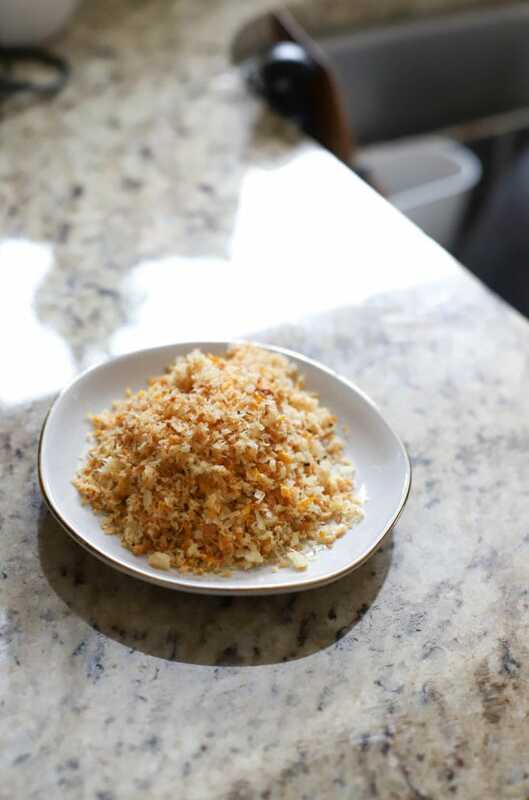 While the carrots are roasting (or after you’ve finished making them), make the Meyer lemon bread crumbs aka YES WE CAN. 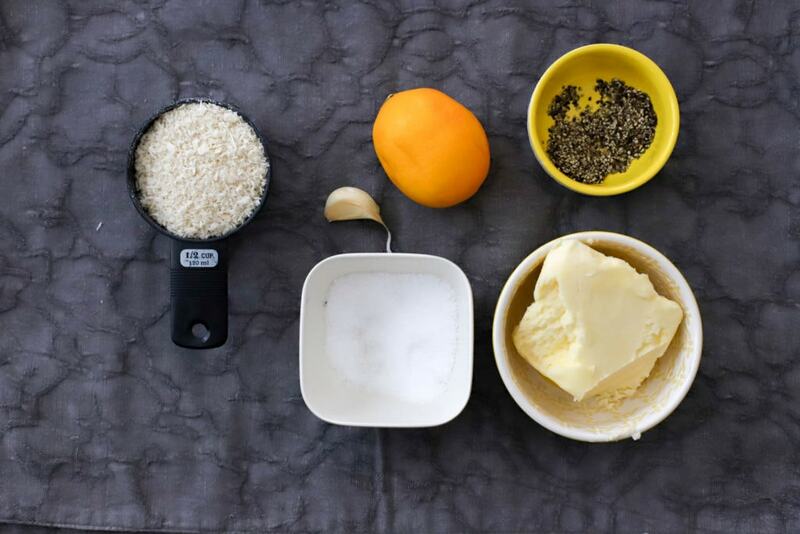 Grab panko bread crumbs, butter, salt and pepper, a garlic clove, and a Meyer lemon. Zest the lemon for the bread crumbs then cut it into wedges for the fish. Preheat a little skillet to medium-high heat, and add the butter and panko crumbs. 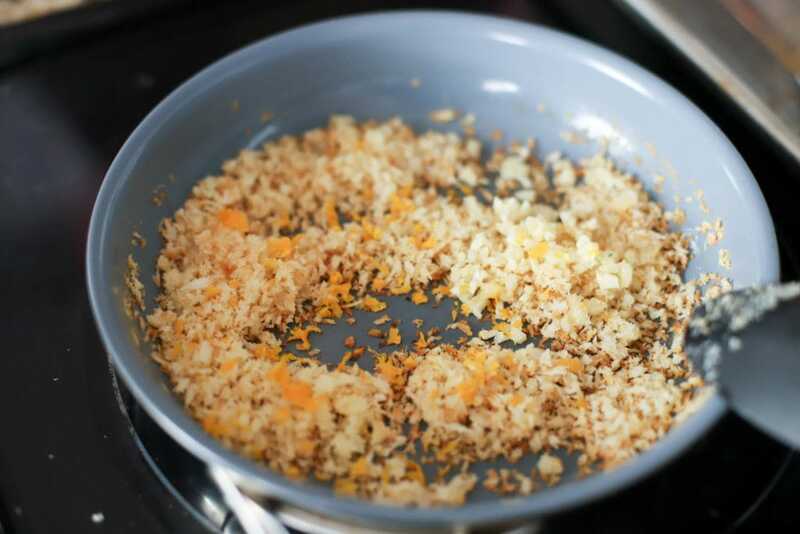 Stir them together for about 3 minutes until the crumbs start to turn golden, then turn the heat OFF and add the rest of the ingredients: lemon zest, minced garlic, salt, pepper. Stir the crumbs together in the hot-but-off skillet for just a minute, then transfer them to a small dish until you’re ready to serve. When the carrots and breadcrumbs are done, I get to work on the fish! Preheat another skillet to medium-high with a drizzle of olive oil and a pat of butter. Sprinkle the fish all over with salt and pepper. 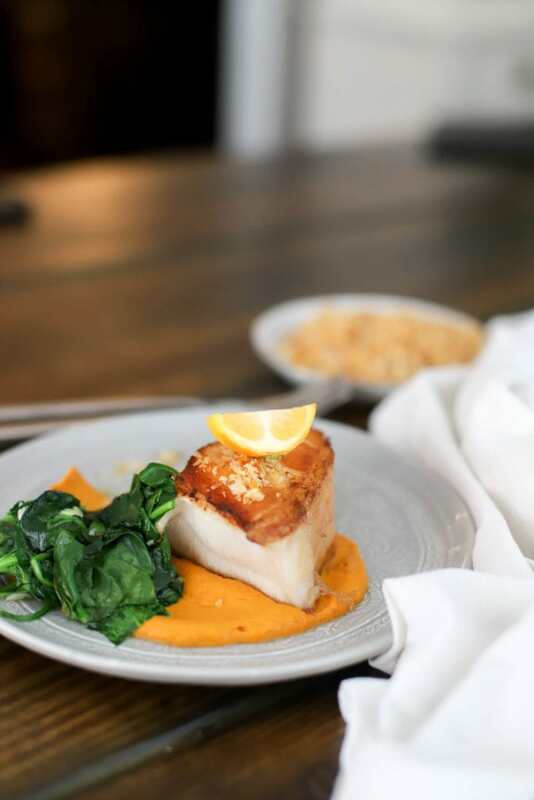 When the butter foams, add the sea bass and sear it for about 2 minutes on all sides (depending on how hot your skillet is), including the ends and sides, until lightly brown and crispy on the outside. 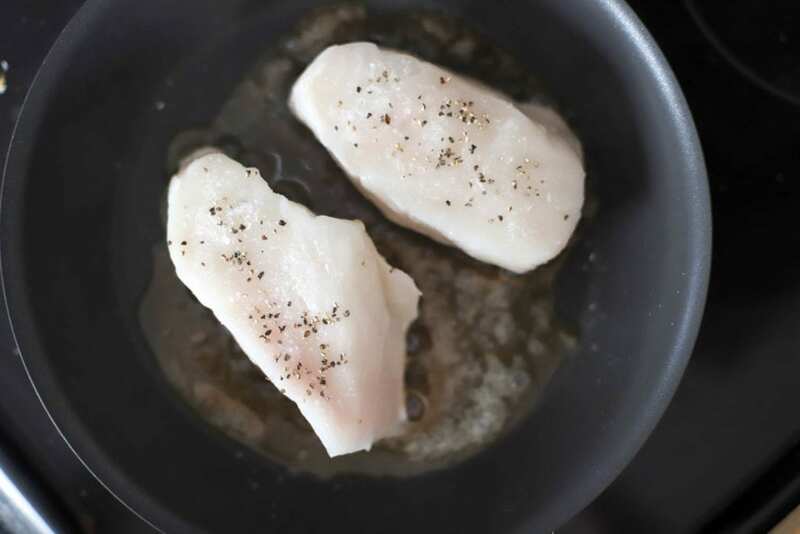 I like using a nonstick skillet for fish so that it glides in and out of the pan without a lot of fuss. Sea bass is expensive, man! Gotta protect it. When the sea bass is alllllmost done, preheat yet another skillet to medium-high heat for the spinach. 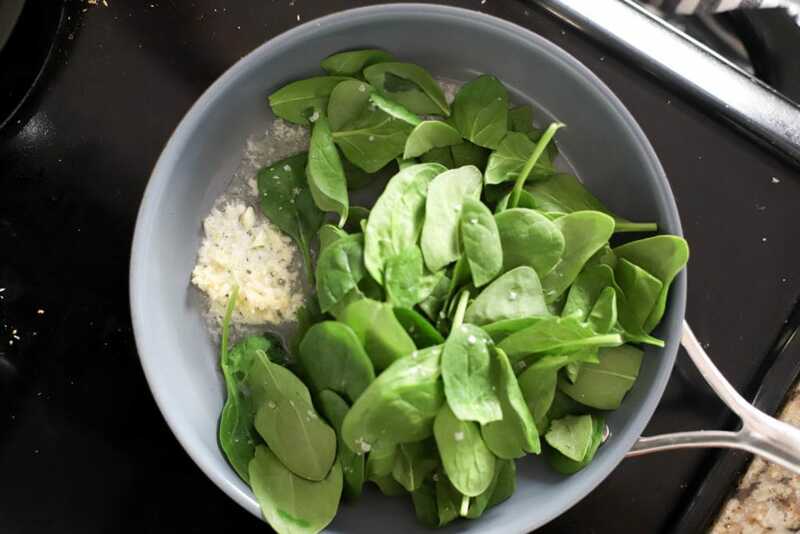 Add some butter, the spinach, and a clove or two of minced garlic with a sprinkle of salt. Saute the spinach for one minute, maybe two, until it’s just wilted, then turn the heat off. And, done! 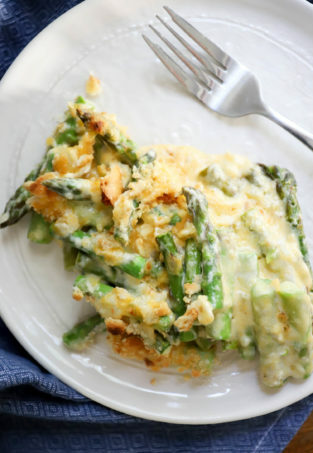 I know it sounds like a lot, but each of the components are really simple and the end result is SO good with the flavors and textures all together. I seriously could eat these carrots plain slash for every single meal, and the crispy on the outside, buttery on the inside fish is just such a treat, then green garlicky stuff for our health and toasty bread crumbs bring the entire thing together. Maybe for Valentine’s Day, maybe not, but definitely for sure for YOU. 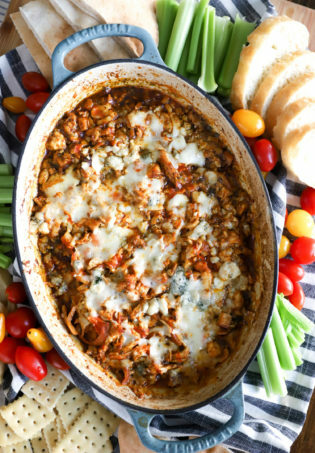 Make this soon, and make it often! 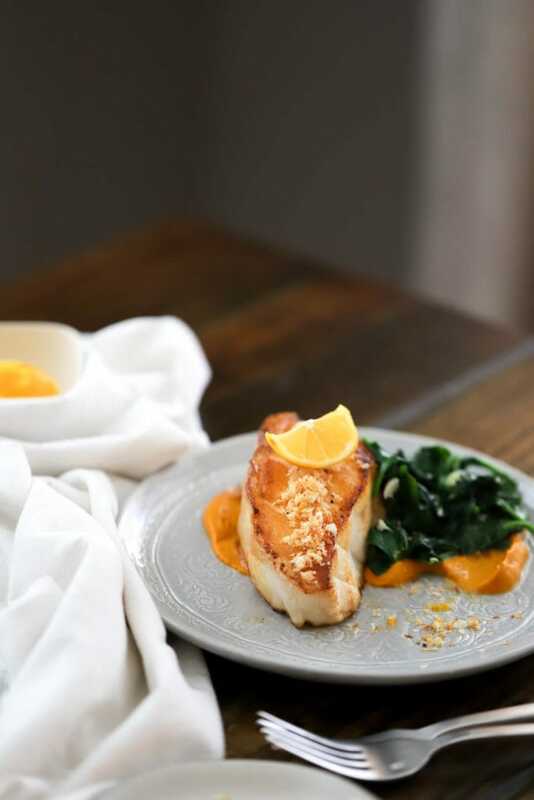 Tender sea bass, seared so simply to highlight the fish, surrounded with silky pureed carrots, spinach, and garlic Meyer lemon bread crumbs for a perfect crunch. 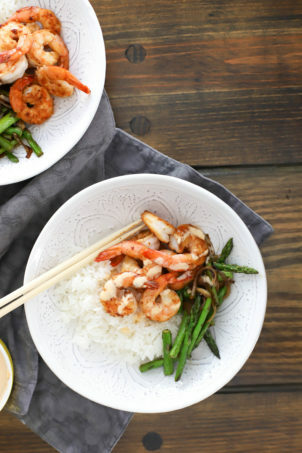 Your new at-home fancy meal is here! Carrots: Preheat the oven to 450F. 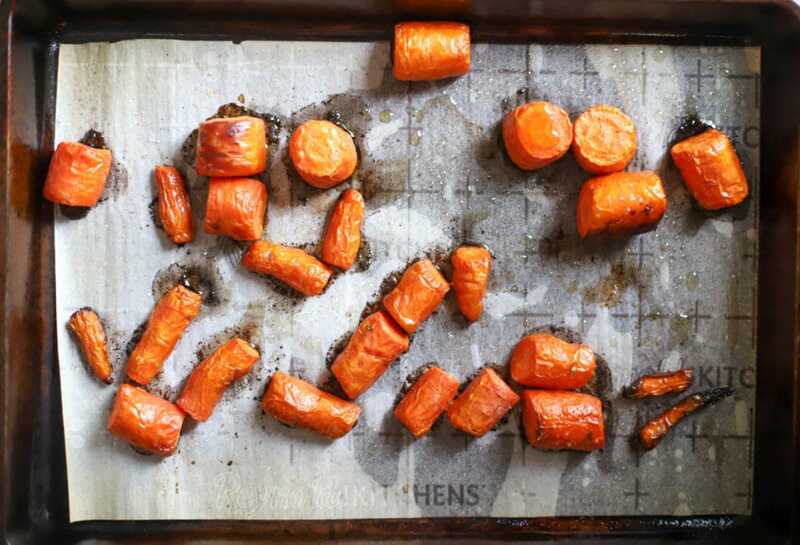 Cut the carrots into chunks, and arrange them on a baking sheet. Drizzle the carrots with olive oil and sprinkle with salt and pepper. Roast for 20-25 minutes until tender and dark at the edges. 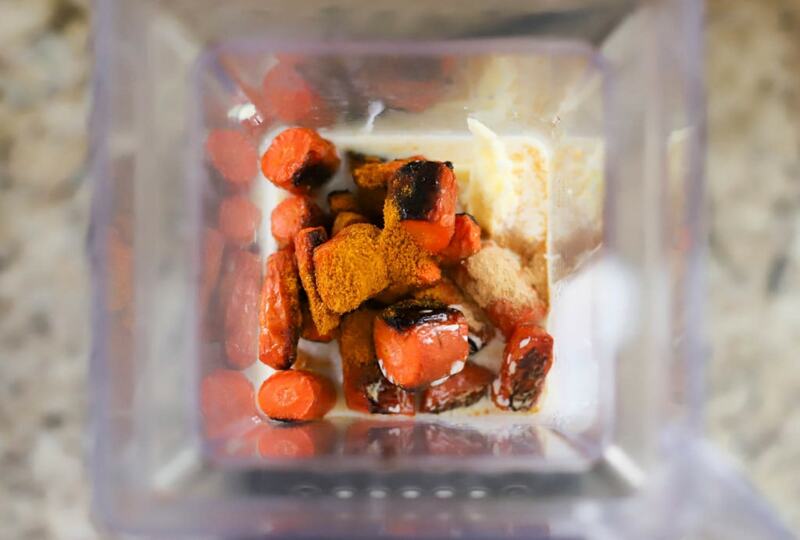 When the carrots have roasted, transfer to a blender with the rest of the ingredients. Puree until very smooth and adjust seasonings to your taste: I start with 1/2 teaspoon salt and increase as needed. Add more stock 1 tablespoon at a time to achieve the consistency of thin mashed potatoes. While the carrots are roasting, make the bread crumbs: Add the butter and panko to a small skillet over medium high heat. Stir to combine and toast the bread crumbs for just a minute or two until golden brown. Turn the heat OFF and add the Meyer lemon zest, garlic, and a sprinkle of salt and pepper. Transfer the bread crumbs to a dish for serving and cut the lemon into wedges for the fish. 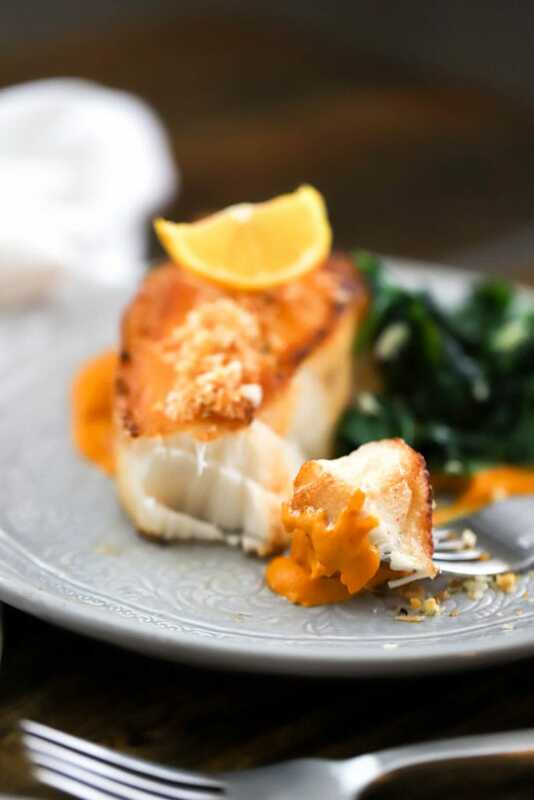 When the carrots and bread crumbs are done, preheat a nonstick skillet for the sea bass with a drizzle of olive oil and a pat of butter. Sprinkle the sea bass all over with salt and pepper. 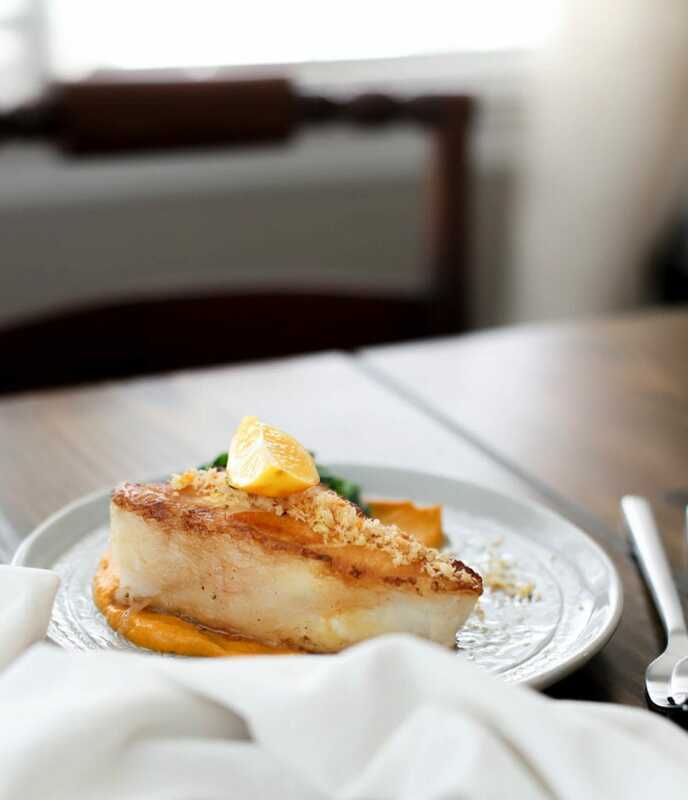 When the butter foams, add the sea bass and let sear undisturbed for about 2 minutes or until golden, then turn, searing on all sides until light golden brown. When the sea bass is nearly done, preheat another skillet to medium heat for the spinach. Add the spinach, garlic, butter, and a sprinkle of salt. Saute for 1-2 minutes until the fish is just barely wilted. 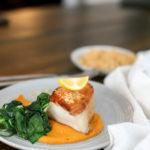 Spread some carrot puree on each plate, then top with a piece of fish and half the spinach. Sprinkle the plate with bread crumbs and serve with Meyer lemon wedges. Enjoy! Carrots: Can be made in advance, a day or two even, and reheated in the microwave. 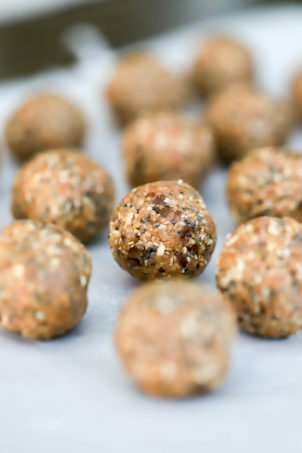 Taste them again for seasoning and add a few fresh pinches of salt if needed. Bread Crumbs: Use a regular lemon if you don't have a Meyer lemon! Fish: Any kind of fish you like will work here! 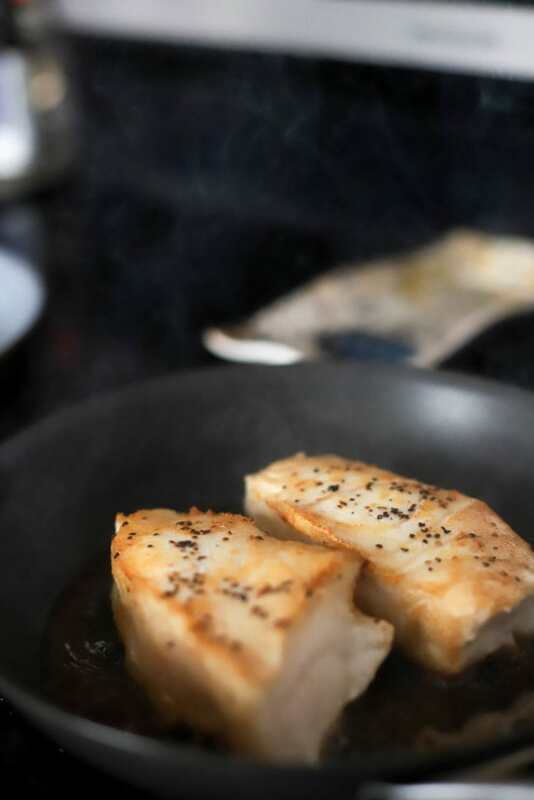 I like skin-off for a nice even sear, and sea bass is such a treat, but cod and halibut are similar and equally delicious.